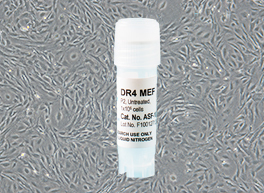 We offer multiple lines including: CF-1, DR4, Neo-resistant and SNL (STO) feeder cells. All MEF cells are manufactured in the US and have an average viability of 95% after thawing. We offer both untreated cells for further expansion and treated cells that can be directly used as a feeder layer. 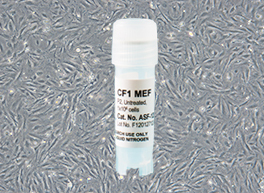 Derived from CF-1 mouse embryos; and used as feeder cells to support ESC and iPSC cultures. Derived from DR4 mouse embryos and are resistant to Neomycin, Hygromycin, Puromycin and 6-thioguanine. 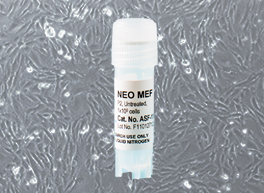 Neo-resistant MEF Feeders are isolated from mouse embryos that are genetically engineered to contain neomycin-resistance genes. 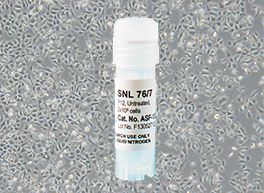 The SNL 76/7 cell line is derived from a mouse fibroblast STO cell line transformed with neomycin resistance and murine LIF genes. Gruzdev, A., Scott, G. J., Hagler, T. B., & Ray, M. K. (2019). CRISPR/Cas9-Assisted Genome Editing in Murine Embryonic Stem Cells. In Mouse Models of Innate Immunity. Humana Press, New York, NY. 1690:1-21. Snijders, K. E., Cooper, J. D., Vallier, L., & Bertero, A. (2019). Conditional Gene Knockout in Human Cells with Inducible CRISPR/Cas9. In: Luo Y. (eds) CRISPR Gene Editing. Methods in Molecular Biology, Humana Press, New York, NY. 1961:185-209. Tan, C. E. H. (2018). Establishing a genetically engineered mouse ES cell line expressing an inducible Xist transgene along chromosome 19 (Doctoral dissertation). Fogarty, N. M., McCarthy, A., Snijders, K. E., Powell, B. E., Kubikova, N., Blakeley, P., ... & Maciulyte, V. (2017). Genome editing reveals a role for OCT4 in human embryogenesis. Nature, 550(7674), 67-73. Molokanova, O., Schönig, K., Weng, S. Y., Wang, X., Bros, M., Diken, M., ... & Eshkind, L. (2017). Inducible knockdown of procollagen I protects mice from liver fibrosis and leads to dysregulated matrix genes and attenuated inflammation. Matrix Biology. https://doi.org/10.1016/j.matbio.2017.11.002. Marttila, S. (2017). Establishment and characterisation of new human induced pluripotent stem cell lines and cardiomyocyte differentiation: a comparative view. Master’s Thesis, University of Tampere, May 2017. Honda, A., Kawano, Y., Izu, H., Choijookhuu, N., Honsho, K., Nakamura, T., ... & Sankai, T. (2017). Discrimination of stem cell status after subjecting cynomolgus monkey pluripotent stem cells to naive conversion. Scientific reports, 7, 45285. For more references, visit our reference page. For more references, visit our reference page..
Heim, C. N., Fanslow, D. A., & Dann, C. T. (2012). Development of quantitative microscopy-based assays for evaluating dynamics of living cultures of mouse spermatogonial stem/progenitor cells. Biology of reproduction, 87(4), 90-1. Mauney, J. R., Ramachandran, A., Richard, N. Y., Daley, G. Q., Adam, R. M., & Estrada, C. R. (2010). All-trans retinoic acid directs urothelial specification of murine embryonic stem cells via GATA4/6 signaling mechanisms. PloS one, 5(7), e11513. Yang, J., Ryan, D. J., Lan, G., Zou, X., & Liu, P. (2019). In vitro establishment of expanded-potential stem cells from mouse pre-implantation embryos or embryonic stem cells. Nature protocols, 1. Kime, C., Rand, T. A., Ivey, K. N., Srivastava, D., Yamanaka, S., & Tomoda, K. (2015). Practical integration‐free episomal methods for generating human induced pluripotent stem cells. Current protocols in human genetics, 87(1), 21-2. Takahashi, K., Narita, M., Yokura, M., Ichisaka, T., & Yamanaka, S. (2009). Human induced pluripotent stem cells on autologous feeders. PloS one, 4(12), e8067. Park, I. H., & Daley, G. Q. (2009). Human iPS cell derivation/reprogramming. Current protocols in stem cell biology, 8(1), 4A-1. Okita, K., Ichisaka, T., & Yamanaka, S. (2007). Generation of germline-competent induced pluripotent stem cells. Nature, 448(7151), 313. Takahashi, K., Okita, K., Nakagawa, M., & Yamanaka, S. (2007). Induction of pluripotent stem cells from fibroblast cultures. Nature protocols, 2(12), 3081. McMahon, A. P., & Bradley, A. (1990). The Wnt-1 (int-1) proto-oncogene is required for development of a large region of the mouse brain. Cell, 62(6), 1073-1085.